You are here: Home > MCSD News & Alerts > MCSD News & Alerts > District News > Support Muskie Bands this Wednesday, December 14th! The Muskie Bands are teaming up with Hy-Vee Food Store, 2400 Second Avenue, for the easiest fundraiser ever! 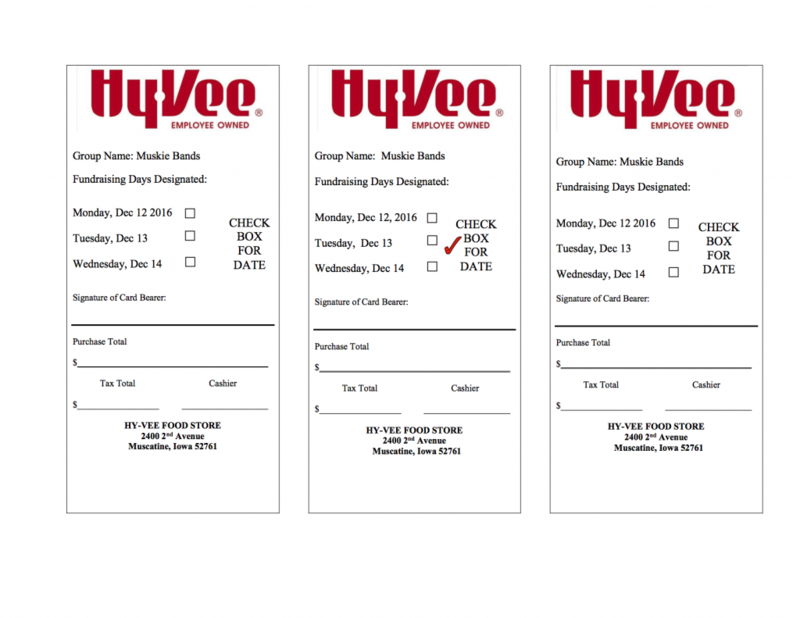 For every purchase made at the Muscatine Hy-Vee Food Store Monday, December 12 through Wednesday, December 14 that is accompanied with the attached slip, Hy-Vee will donate 7% of your total sale to the Muskie Bands! This is a great time to stock up on groceries for holiday cooking and baking needs. If you don’t have time to shop, please consider purchasing a Hy-Vee gift card to use later. And of course – groceries! Please help us spread the word by sharing the attached slip on your social media sites, with neighbors, friends, relatives, co-workers, etc. The more people that present the attached slips during the designated three days, the more money raised to support Muskie Bands!